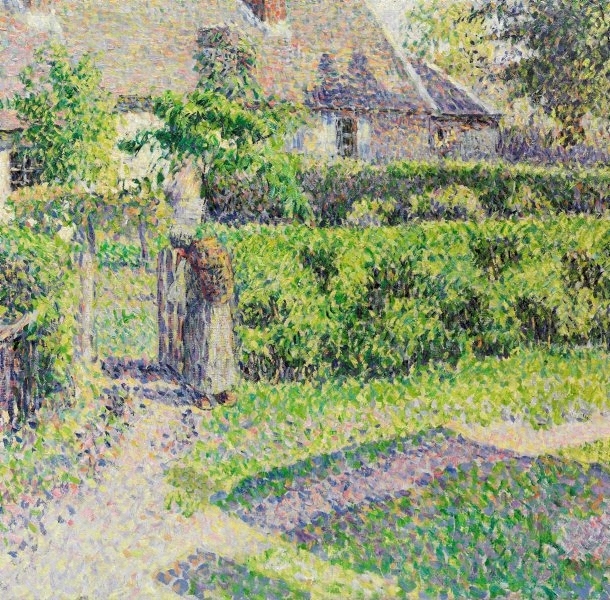 Between 1884 and 1888 Pissarro experimented with the pointillist method of the younger Seurat. 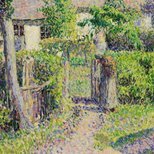 For an avowed anarchist it was perhaps no great step, but in art-historical terms Pissarro's stylistic shift, however momentary, coincided with the end of impressionism's avant-garde ascendancy. 'Peasants' houses, Eragny' was painted during this fascinating interlude. 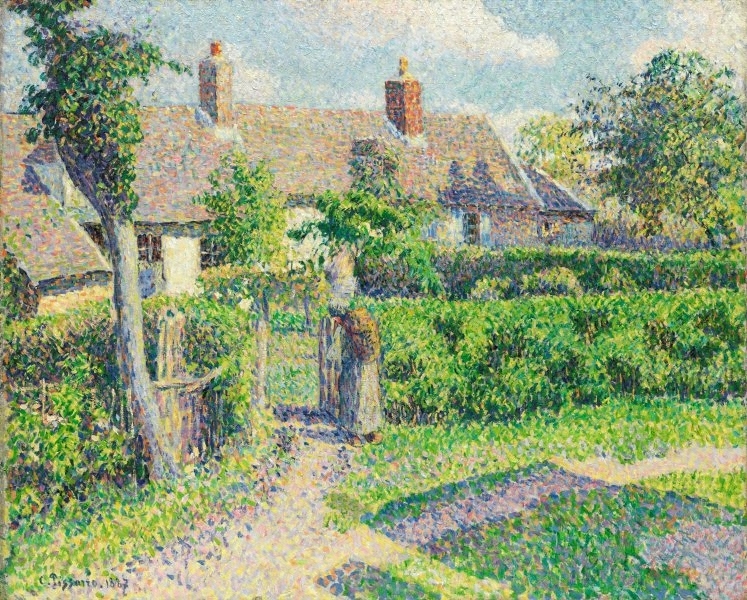 Pissarro has fully absorbed the tenets and techniques of the distinctive style. Form is constructed by discrete juxtaposition of individual strokes, or 'dots', of pigment. Atmosphere is suggested by chromatic scintillation. Surface is treated as a single unity. The mechanical effect which can deaden pointillist painting is obviated by Pissarro's acute sense of the internal dynamics of design. 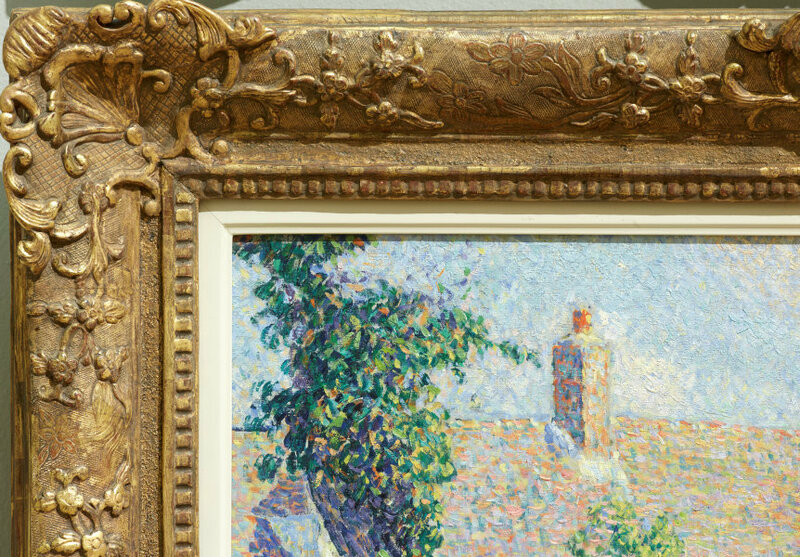 The cast shadows intruding from the right are deliberately naive; this was to be an important innovation for the younger generation of post-impressionists such as Gauguin and Cezanne. 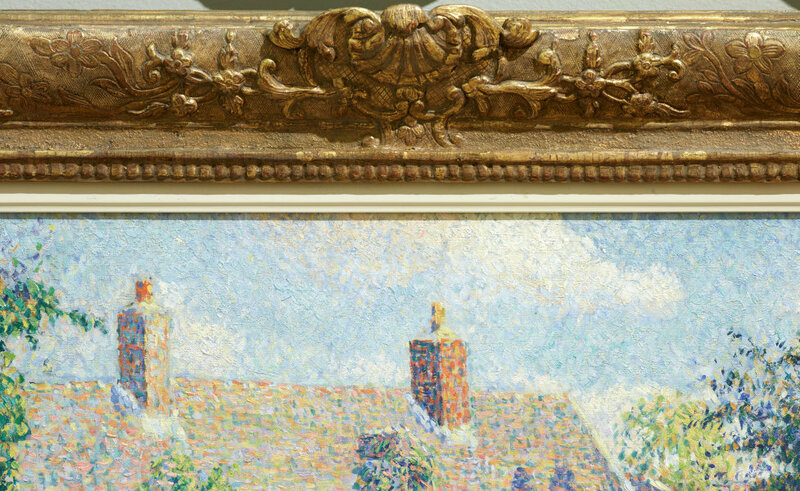 Signed and dated l.l., oil "C. Pissarro 1887". Étienne Bignou, Paris, 1934, Paris/France, [dealer] lent to the exhibition 'French painting of the Nineteenth Century' touring Canada, January - March 1934. Etienne Bignou was closely connected with Alex Reid & Lefevre, London. Alex Reid & Lefevre, Ltd., 25 Nov 1934-30 Sep 1935, London/England, Purchased by Alex Reid & Lefevre, London from CW Kraushaar Galleries, 25 November 1934. Society of Artists, 30 Sep 1935, Sydney/New South Wales/Australia, Purchased by the AGNSW from the New South Wales Society of Artists 1935. Purchased from the annual exhibition of the New South Wales Society of Artists, 6 September - 4 October 1935, the NSW Society of Artists were acting as Sydney agents for Alex Reid & Lefevre. Renée Free, AGNSW Collections , 'The Western Heritage, Renaissance to Twentieth Century', pg. 108-172, Sydney, 1994, 138 (colour illus.). 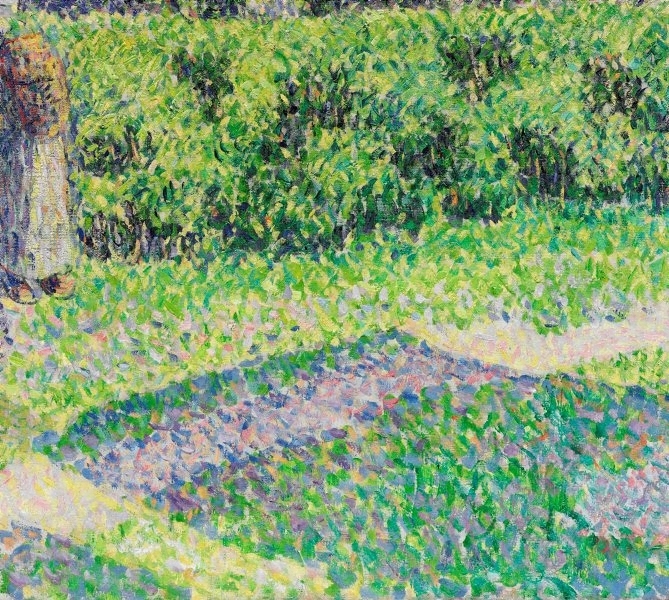 Ted Gott, Radiance: the neo-impressionists , 'Early Neo-Impressionism', pg.25-37, Melbourne, 2012, 30, 31 (colour illus.). Bruce James, Art Gallery of New South Wales handbook , 'Western Collection: Paintings and Sculpture', pg. 17-77, Sydney, 1999, 48 (colour illus.). 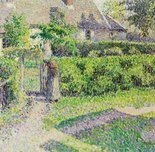 Alan Krell, Art Gallery of New South Wales collection series 4 , 'Camille Pissarro 1830-1903. 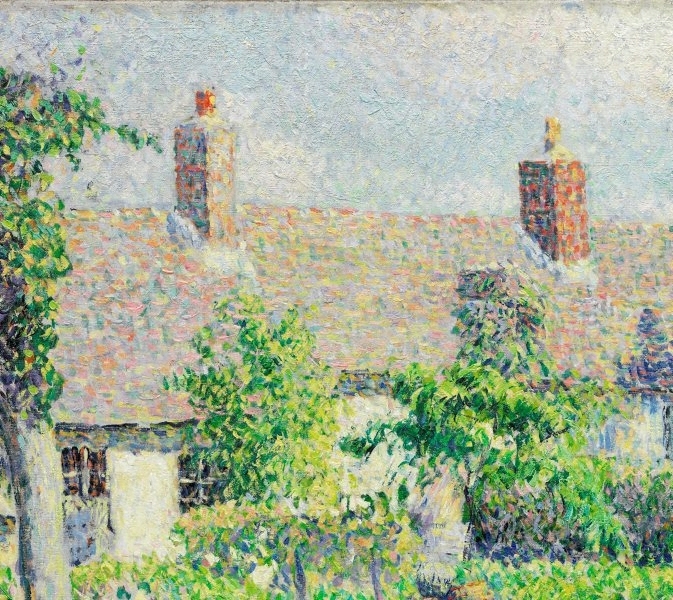 Peasants' Houses, Eragny. 1887', pg. 1-3, Sydney, Winter 1983, 1 (illus. ), 1-3. Justin Paton, Look , 'The great outdoors', Sydney, May 2016, pp 34–35: col illus p 34. J. Rewald, Gazette des Beaux-Arts, 81 , Article, pg. 65-108, Paris, 1973. Ross Steele, Art and Australia , 'French Impressions', pg. 87-93, Sydney, Spring 1984, 91 (colour illus.). 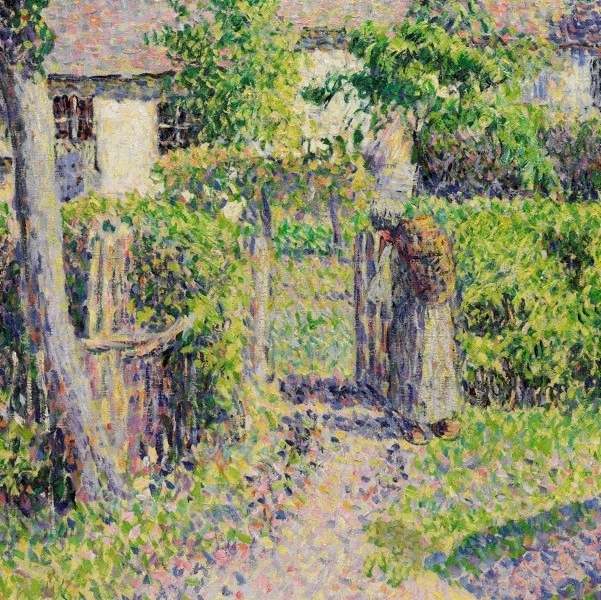 Pissarro à Éragny. La nature retrouvéee , Paris, 2017, pp 66, 203, no 13, col illus p 65. Art Gallery of New South Wales picturebook , Sydney, 1972, 33 (colour illus.). Neo-Impressionism , New York, 1968, 81. French art from Australian collections , Brisbane, 1959, (illus.). Modern masterpieces , London, 1935-1936, (colour illus.). 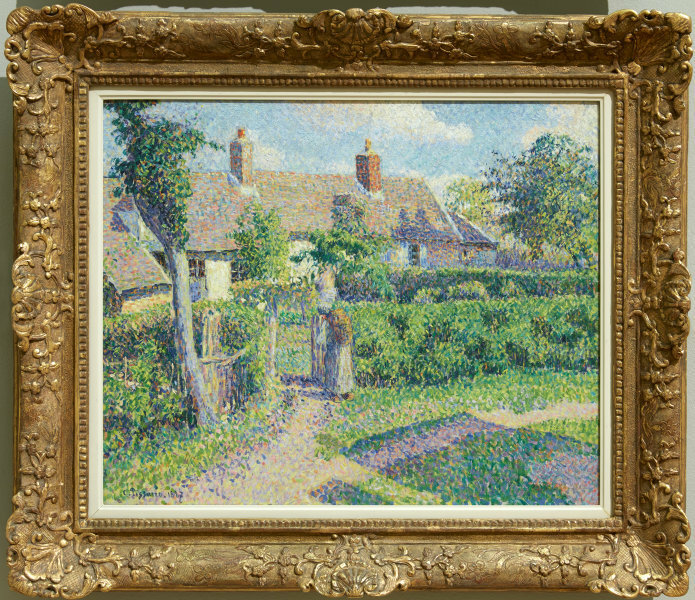 Camille Pissarro, Son Art - Son Oeuvre , Paris, 1939, Vol. 1, 181; Vol. 2, 148 (illus.). cat.no. 710, as 'Maisons de paysans, Eragny'. Exhibition of Society of Artists , Unknown, 1935, (illus.). cat.no. 144, as 'La Chaumiere'. Van Gogh à Paris , Paris, 1988, (illus.). Art Gallery of New South Wales annual report 2014–15 , Sydney, 2015, p 32. The Impressionists: masterpieces from the Musée d'Orsay , Melbourne, 2004, 90, 91 (colour illus.). From caves to canvas: an introduction to western art (Second edition) , 'Artists of Modern Parisian Life: Impressionism, Rodin's Studio and Industrial Cities', pg.180-210, Sydney, 1998, 187 (colour illus.). From caves to canvas: an introduction to western art , Sydney, 1992, 187 (colour illus.). Art Gallery of New South Wales handbook , Sydney, 1988, 48, 50 (illus. ).